Ngawang Drakpa was one of the closest disciples of the great master Je Tsong Khapa. He met and learnt from the master just after the master's Gelong ordination and well before the first contact of Tsong Khapa with his 3 more famous disciples : Gyaltsab Je, Kedrup Je and the 1st Dalai Lama. Ngawang Drakpa, although less famous throughout history, was no doubt one of the closest heart disciples of Tsong Khapa. 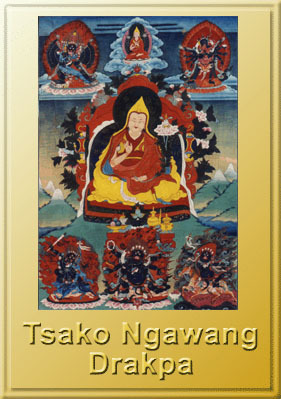 Some of the most important texts composed by Tsong Khapa were originally written for Ngawang Drakpa or were composed on the personal requests of this disciple, among them the 3 Principal Aspects of the Path, the account of the famous Bodhisattva Ever-Weeping and the Sadhana of the 13-deity Yamantaka. In the 3 Principal Aspects of the Path, Je Tsong Khapa calls Ngawang Drakpa 'my son', showing a personal affection not very typical of the great scholar. In a letter that Tsong Khapa sent to his disciple, the master implores Ngawang Drakpa to follow his private instructions. He urges him to act and pray, in all his lives, as his teacher does. And he invites Ngawang Drakpa to meet him again, at the end, in enlightenment - where he promises to offer his favored disciple the first sip of their cup of immortality. Ngawang Drakpa was born in 1365 in the region of eastern Tibet known as Gyalrong (or as Gralmorong). His father was a local king and the family was Bonpo (a form of Shamanistic religion). Ngawang Drakpa became famous for his knowledge in the Bonpo religion and was known as Wangpo Ngawang Drakpa, the title 'Wangpo' being a respected title given only to masters coming from royal families. In 1381, at the age of 16, Ngawang Drakpa went to central Tibet with 4 other monks. During May, 1382, they arrived at Lhasa. In 1385 he met and became a disciple of Je Tsong Khapa. He was later given the title of 'Khenchen' (master abbot), by Tsong Khapa. Thus in the biography of Je Tsong Khapa, Ngawang Drakpa is addressed as Tsako Wangpo Khenchen Ngawang Drakpa (the word 'Tsako' denotes the place of his birth, a region of Gyalrong. Eastern Tibet). He is also known as one of the '4 Original disciples' of Tsong Khapa. In 1409, when Tsong Khapa initiated the Monlam Chenmo, ( the annual grand prayer festival which continued up to 1959 ), Ngawang Drakpa was one of his major assistants. In the 4th lunar month of 1409, Ngawang Drakpa and Tsong Khapa performed a nyunglay fasting retreat together at Jokhang (the grand cathedral of Lhasa). Ngawang Drakpa was asked to observe his own dreams. He dreamt of 2 white conch-shells descending from the sky, merged into 1 and fell into his lap. In his dream, he blew the conch-shell towards the east and it made a loud sound. The next day, Tsong Khapa explained that the conch-shell meant that Ngawang Drakpa would spread the pure teachings of the Buddha, his blowing it towards the east in the dream meant that Ngawang Drakpa was destined to teach in his birth place, eastern Tibet, and the loud sound meant that his activities would be successful. In 1409, Ngawang Drakpa decided to return to eastern Tibet. Before Ngawang Drakpa's departure, according to legends, Tsong Khapa presented the disciple with a set of crystal rosary. Upon receiving it, Ngawang Drakpa immediately made a vow to establish as many monasteries as the number of beads on the rosary (there were 108 crystal beads) as a way to repay the guru's kindness. On his way back to east Tibet, Ngawang Drakpa paid homage at Tsong Khapa's birth place, where the famous monastery of Kumbum was to be built years later. Ngawang Drakpa traveled extensively throughout the Gyalrong region and founded 107 monasteries before he built the grand Dhe-Tsang Monastery, which was to become the spiritual headquarters of all Gelugpa monasteries in the Gyalrong region. 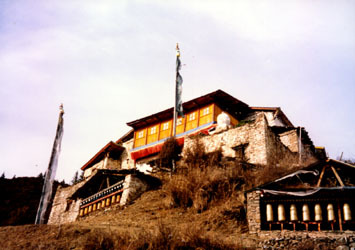 Dhe-Tsang Monastery was the 108th and the last of the series of monasteries that he promised to build. The monastery construction was completed in 1414, just 5 years after the founding of Gadan Monastery, the first monastery of the Gelugpa lineage founded by Tsong Khapa. The name 'Dhe-Tsang' means 'Fulfillment' or 'Completion' and was given to this monastery as the founding of it marks the fulfillment of Ngawang Drakpa's promise to build 108 monasteries. Ngawang Drakpa served the Dhe-Tsang Monastery as the founding abbot and passed away in Chakor Monastery (about 100 kilometers from Dhe-Tsang) in 1431, at the age of 65 and after several months of intensive meditation retreats. 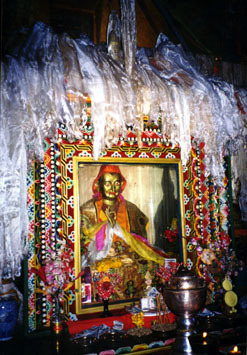 Ngawang Drakpa's holy body was preserved in a stupa at this monastery. At Dhe-Tsang Monastery, statues and stupas in memory of this great master were also built. Sadly, these were destroyed in the 1950's. In 1983, His Holiness the 10th Panchen Rinpoche made a pilgrimage to Chakor Monastery and donated generously towards the restoration of Ngawang Drakpa's stupa. 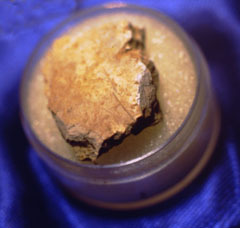 Some of Ngawang Drakpa's remain, said to be part of his skull, was given by a monk who hid the piece from desecration for the new stupa. Dhe-Tsang Monastery also built new statues in memory of its founder in 1983. In 1993, Khejok Rinpoche returned to the Gyalrong district for a brief visit and paid homage to the new stupa at Chakor. In 1999, the monastery acquired another piece of Ngawang Drakpa's skull from the same monk who donated the first piece for the Chakor stupa and is now planing to build another stupa to house this precious relic. Ngawang Drakpa's disciple Choje Drakpa (some hold the view that he was also the younger brother of Ngawang Drakpa) succeeded as the monastery's 2nd abbot. There is a restored stupa at Chakor Monastery right next to the restored Ngawang Drakpa stupa in memory of Choje Drakpa, probably housing some of Choje Drakpa's relics. Unlike the Dalai Lamas and other eminent lamas of the same rank, there have been no official recognition for the incarnations of Ngawang Drakpa. However, it is commonly accepted that the great Pabongkha Rinpoche Dechen Nyingpo was one of his incarnations. Even Pabongkha Rinpoche himself said, during a conversation with his own mother at Sera Monastery, on occasion too the thought comes to my mind that I have been other people as well, in other times urging the days when our great and gentle protector Tsong Khapa lived on this earth I was, I sometimes think, that friar from Tsako - Ngawang Drakpa*'. In fact, this great lama identified himself more with Ngawang Drakpa than with the Jangya Tulku he was more officially regarded as, although the latter was much more influential and famous ( some of the Jangya Tulkus have been the teachers of Chinese emperors and enjoyed political status more or less equivalent to the emperors themselves. For more information regarding the Jangya Tulkus, refer to the pilgrimage to Wutaisan page in this website) than Ngawang Drakpa. Pabongkha Rinpoche belonged to the Gyalrong House of Sera-Mey College, which has close connection with Ngawang Drakpa. He was considered 'part of the family' amongst the Dhe-Tsang monks studying at Gyalrong House of Sera-Mey.